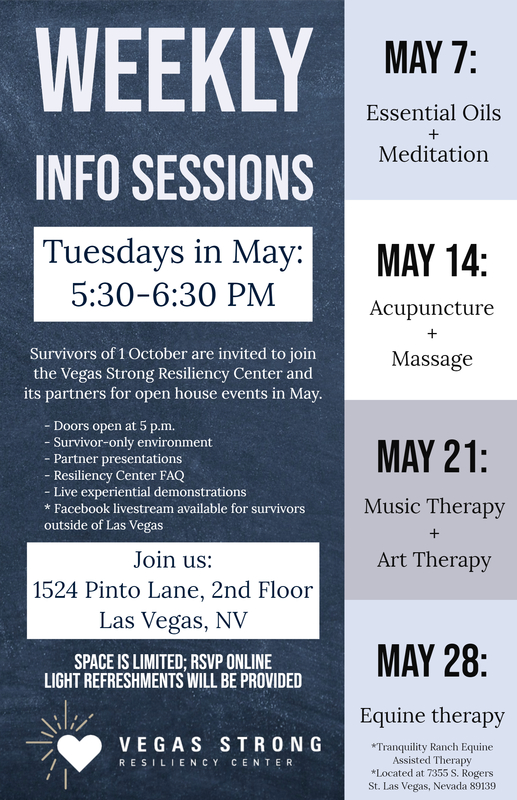 Survivors of 1 October are invited to join the Vegas Strong Resiliency Center and its partners for open house events every Tuesday in May. Everyone heals differently and in their own time. Partners of the Vegas Strong Resiliency Center will be onsite to demonstrate and discuss how various supportive therapeutic methods can aid the healing process. During these sessions, we will also take time to answer questions you may have about the Resiliency Center and how we can assist you. Registration is limited to 50 people per event due to space constraints, and we suggest you RSVP here for the May 7 event to ensure your spot.